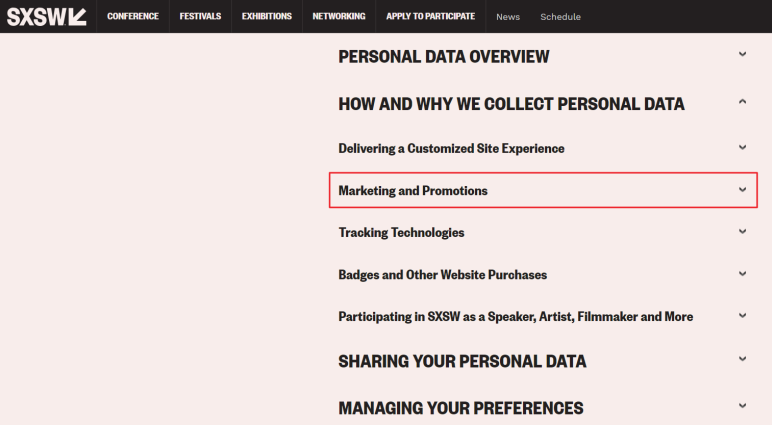 In this article, we’ll take a look at what personal information is and explore some of the reasons why event websites require personal information from attendees. Most event websites collect personal information from attendees at the time of registration, for purchasing online tickets, and for creating an account with the event website. Personal information is any sort of information that can be used to distinguish an individual such as a social security number, email address, or biometric records. In some cases, information (that may not be personal information on its own) becomes personal information when combined with other information such as first name, last name, and date of birth. Some events request attendees to provide additional personal information so that they can deliver a more personalized event experience. For instance, they might ask attendees to fill out a quick survey before and after the event. Or they might set up an event app that asks attendees what types of activities they’d be most interested in attendees. This way, they can send out automatic, personalized notifications to update event attendees concerning important information about the upcoming event. Let’s take a look at some of the reasons why event organizers require attendees to provide personal information. One of the reasons event organizers ask attendees to provide personal information is so that they can deliver a more personalized event experience. For instance, they might ask for the attendees’ contact number to be able to send them event-related notifications before the event via email . For destination events, event organizers might ask attendees to let them know which hotel they’re staying at so they can notify them about traffic-related details and the best route to take from their hotel on the day of the event. This way, attendees will be able to reach the event on time without having to worry about traffic. In addition to this, some event websites have a members-only section that event attendees can access for premium content, downloadable resources, or receive premium services. Event organizers might also ask attendees to provide their email address so that they can request feedback after the event. In such a case, the event organizer would put together a list of questions regarding which event activities the attendee enjoyed the most or which speaker was their favorite to get an idea of what generates interest. By doing so, event organizers are able to gather important data about their attendees’ event experience and use it to improve future events. Be sure to check out our article on How to Use Surveys to Plan Better Events for instructions on how to send surveys to request feedback using Event Espresso. In addition to this, some event organizers collect information passively using cookies, tracking pixels, and web beacons. For example, they might collect information regarding their attendees’ interaction with their emails to see how many emails were opened. This lets them run A/B tests on email subject lines to see which ones get higher click-through rates. Business events – such as conferences, seminars, and workshops – collect personal information from attendees to share with their sponsors and other attendees. 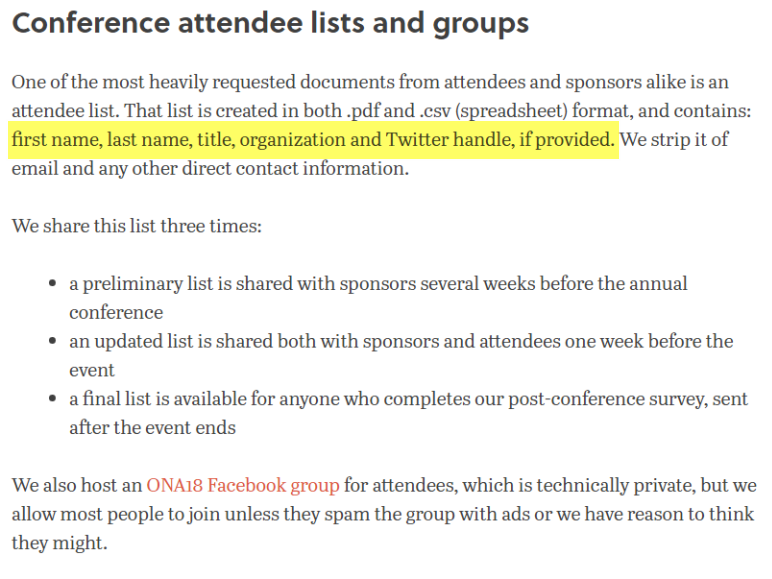 For instance, they might publish a list of attendee names along with their company and title on a members-only section on their website. Many times, sponsors request attendee lists well before the event so that they can reach them directly or simply to generate brand awareness by offering them free products. This way, event organizers are able to secure sponsorships for their events from big-name brands. In addition to this, event organizers might consider publishing a list of prospective attendees on their event website to encourage registrations in the final days leading up to the event. Seeing a list of peers and industry professionals often encourage people to register for events – especially if the event offers networking opportunities. Event organizers might also collect personal information from you at the time of registration to contact you after the event with marketing offers and details about related, upcoming events. 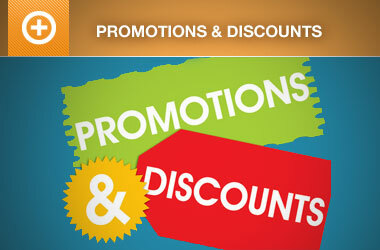 For instance, an event organizer might offer attendees special discounts or coupon codes to their next event via email. 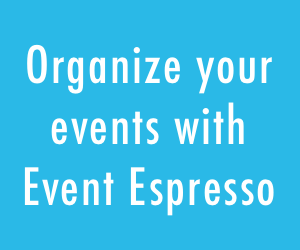 Event Espresso offers a number of features to help you collect data from attendees. For instance, you can use its built-in Accurate Attendee Manager to keep track of who registered for your event, which event they registered for, and how much they paid. You’re able to use this information to communicate with attendees individually or collectively (i.e. in an email list). You’re also able to use the Event Registration Forms to collect all the data you need to deliver memorable event experiences to attendees. And the best part is that you own all of the data you collect. 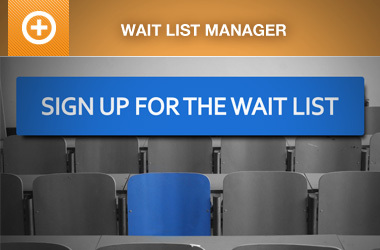 This includes attendee name, address, transaction details, and much more. You’re able to export it into Excel or CSV format for further processing such as to generate reports, compute attendee statistics, or devise marketing strategies. Event organizers collect personal data from attendees for a number of reasons. Depending on the type of event they are hosting and the services offered, they might ask for email addresses, contact numbers, location details, and billing information. What sort of personal information do you collect from event attendees and how do you use it to deliver a better event experience? Let us know in the comments section below.